This is the 7th in a series of 8 articles on checkout usability that combine findings from our checkout usability report and benchmark of the 100 largest e-commerce sites. During both our checkout- and mobile e-commerce usability studies the vast majority of the test subjects had trouble understanding various form field labels. This of course turned out to be critical in some cases when a subject was unable to make sense of a label for a required field, making it impossible for her to complete the purchase. In less severe instances the outcome was invalid data input – in some cases intentional (the subject simply filled the field with “N/A” or alike and hoped it would pass validation) but most often unintentional (due to misinterpretation of the label). We observed that on sites without additional descriptions to the form field labels, the test subjects who were confused by a label essentially were left with one of four (less than ideal) courses of action: guessing / trial and error, visiting the help section, calling customer support, or abandoning the purchase. Now, the solution is simple and stated in the title of this article: add descriptions to your form field labels. While this might sound easy, we’ve found that of the 100 largest e-commerce sites in the US a whopping 92% of them have “inadequate” form field descriptions one or more times during their checkout process. That is to say: it was very (very) few sites that consistently offered good form field descriptions throughout their entire checkout process. Amazon doesn’t explain their password rules so the customer simply has to guess whether there’s a difference between lowercase and uppercase characters, if both letters and digits must be used, and so on. Inadequate form field descriptions can be anything from sites that don’t explain their password rules (see Amazon above) to sites that don’t explain how they’ll use the customer’s e-mail address, from sites that just ask for a “CVV2” code to sites that don’t give examples of how to format your phone number. In this article we’ll present 15 of these “common offenders” which you can use as a checklist to go over your own site and make sure you’re providing good form field descriptions to help your customers through the checkout process. Good form field descriptions are written to answer four common questions customers ask themselves when filling out a form field: 1) What is being asked for? 2) How should I format the input? 3) Where can I find it? and 4) Why do you need it? 1) What is being asked for? Credit card security code – One value; many names. E-commerce sites are incredibly inconsistent in the labelling of this field, with some sites even relying on technical abbreviations such as “CVV2” which few customers will understand unless they are a frequent e-commerce shopper or a description is provided telling the customer what it is and where to find it on the card. Address line 1 and 2 – It isn’t immediately obvious what part of the customer’s address should go where. 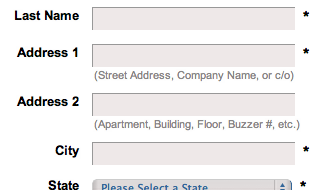 For example, does my apartment number and floor belong in address line 1 or 2? Industry-specific values – Don’t expect customers to be privy to your industry’s unique numbers and codes. For example, if you’re flying in the US you may have the option to enter a “Redress number”, which is hardly a universal concept to unaccustomed travellers and foreigners. Other industry specific labels include “Issuing bank” and “Purchase Order#. Abbreviations – Labels such as “M.I.” and “QTY” can be tricky to decipher, especially for non-native speakers. Similarly, when you’re asked to enter data it’s not always clear if you should provide the abbreviation or full name of a given entity such as an airport code vs the full airport name. 2) How should I format the input? Phone number – Should it be “(415) 315-9567” or “415-315-9567” or “415 315 9567” or “4153159567”? And should I include the country code? While your site should accept all common formats, giving the customer an example is crucial so she at least knows one accepted input formatting that is “safe” to use. Password – What are the password requirements? Is there a minimum or maximum length? Are all characters allowed? Must it be a combination of letters and digits? Is there a difference between lowercase and uppercase characters? Monetary amount – Depending on country and accounting style, monetary amounts can include decimal- and thousand-separators, which themselves can take multiple shapes (a dot, a comma, or a space). Credit card number – Should I include the spaces seen on the physical card? Surprisingly many sites will reject the card number if spaces are included even though this is how they are printed on most credit cards. 3) Where can I find it? Credit card security code – Credit cards are packed with digits printed on both sides. This can make finding the security code a difficult task unless you know exactly where it is and what you’re looking for. To make matters worse, the security code is printed different places and in varying lengths depending on the card type. Coupon code – If the customer has received a coupon or gift card (or similar physical token), you can help her by pointing out exactly where the code(s) can be found on the card. Identification codes – Various types of identifiers are often used to tie offline data to online purchases. These identifiers are commonly printed on utility bills and receipts, and include account IDs, invoice numbers, and serial codes. 4) Why do you need it? Date of birth – To ensure compliance with laws and regulations, the customer’s date of birth may be required in some cases. However, this is often considered a very personal piece of information and depending on your segment it might be outright rude to ask for. So instead of just merely asking for the date of birth, be sure to follow up the field with a decent explanation as to why you’re asking for it as well as how it’s used and stored. Phone number – Customers are being flooded with an ever increasing number of robocalls and phone marketing, so increasingly the customer will think twice before handing out her phone number if you don’t explain why it’s needed. If you only require a phone number for order and shipping purposes, a small description stating this can alleviate the customer’s privacy concerns. The context of your description is crucial: it must be in the right place at the right time. But depending on the type of description needed and the design of your site, different ways of displaying those descriptions may be adopted. There’s at least three common ways of displaying label descriptions: 1) Inline descriptions, 2) Tooltips, and 3) Dynamic descriptions. The easiest way to provide simple instructions, formatting examples and label clarifications, is by the use of inline descriptions. Inline descriptions are typically placed in conjunction with the main label itself or in close proximity to the form field, and are permanently visible to the customer. This way help is always right where you need it. Coastal’s address line descriptions explain what information should go in line 1 and line 2 respectively. To avoid making the checkout form feel cluttered and overwhelming it’s recommended to subdue these inline descriptions (e.g. small grey text). Also, since they are permanently displayed these descriptions should be very concise. Tooltips are a clever way to hide away in-depth descriptions until they are needed. Tooltips often take the form of a question mark icon or a “Learn more” link and can typically be activated by click or mouse hover (just remember to provide a proper fallback for touch devices as they have no hover state). Amazon uses a ‘Learn more’ link to explain why they’re asking for the customer’s phone number. Tooltips are an ideal candidate when you have to explain in detail how the information is used, why it’s required, or where the customer can find the information. If you want to keep a very clean form design while still providing inline text descriptions, you can adopt a more dynamic approach and only reveal the description while the corresponding field has keyboard focus. Combined with inline validation, Twitter first shows you a description when the field is activated. At Kohl’s, the phone number field is auto-formatted as the customer types. This eliminates any formatting ambiguity the customer might have had. The example seen here is for US sites / phone numbers - you should of course always use a formatting example that match your own audience (local ways of formatting. Form field placeholder text can also be used for short descriptions and formatting examples, although they have the inherent drawback of disappearing as the customer types. Therefore, it should only be used for secondary details such as formatting examples to avoid the trap of false simplicity. Victoria’s Secret uses placeholder text to show an accepted input formatting for the customer’s phone number. They also have a tooltip explaining why they are asking for the customer’s e-mail address. In this article we’ve seen the many ways in which form fields may confuse a customer. We’ve pointed to 15 “common offenders” that all benefit from a clarifying description in one way or the other. And finally, we looked at three common ways in which form field descriptions may be implemented. Form field descriptions are certainly not the most exciting thing in this world but don’t underestimate their importance: those ultra-short contextual help texts can clear up ambiguity, ensure the customer doesn’t get stuck, and save your customer support a bunch of repeat questions. By cleverly addressing what is being asked for, how the input should be formatted, where the input can be found, and why it is being asked for, these descriptions can answer all of the customer’s concerns at just the right time in just the right place. Authored by Jamie Appleseed. Published on November 6, 2012. Poor Copywriting – the UX Problem That Will Never Go Away? Your advice is always very thoughtful but I have to disagree with two of your points. - your examples of good practice for address line 2 and phone number formatting would NOT be good practice for a UK audience. I think this once again means we must emphasise testing with people from your target audience. - I cannot, and will not, ever accept any example as good practice that shows labels inside the field boxes. And I’m equally adamant that hints have no place inside fields either. In regards to phone formatting: sometimes we focus so much on the details that we forget to state the obvious “The example seen here are for US sites / phone numbers – you should of course always use a formatting example that matches your own audience (local ways of formatting)”. Our main point is that most of the benchmarked sites dosen’t have any kind formatting examples at all – this was merely to point out that you need to provide formatting example – not how the exact formatting should be like. I have updated the post accordingly. Thanks for pointing this out. In regards to your second point; no form field labels should never be inline. We completely agree on that (http://baymard.com/blog/false-simplicity). I can see that at first sight the Twitter screenshot looks like we recommend this approach of inline labels (e.g. “Password” inside the label) – but the Twitter screenshot is purely meant as an example of how the description can appear dynamically when the field receives focus (the “6-characters or more. Be tricky” only appears on field focus). The only case where we recommend using placeholder text is for secondary details such as phone formatting examples. (This might be the where we disagree). I hope the article is clear enough on that point?